The Avon Historical Society has leased the Derrin farmhouse, located at 249 West Avon Road, and one acre of land on which it is situated from the State since 1996. It is open for tours during the summer months at no charge. A history of the house is detailed in a 2014 Historic Resources Inventory. A deed for the house, dated September 24, 1766, conveying the property to Lucy Page, says that “39 acres of land in the Town of Farmington together with 1/3 part of the house and barn thereon standing….part of a farm of land containing 103 acres owned by me [John Page of Branford] and the said Stephen Darin [husband of Lucy Page, John Page’s father] and is undivided and lies on the West side of the River, against Nod.” The earliest section of the Derrin farmhouse predates 1766. Experts were consulted to examine the construction of the house, including support beams in the basement and the foundation, and have dated the additions to the house as c. 1810. 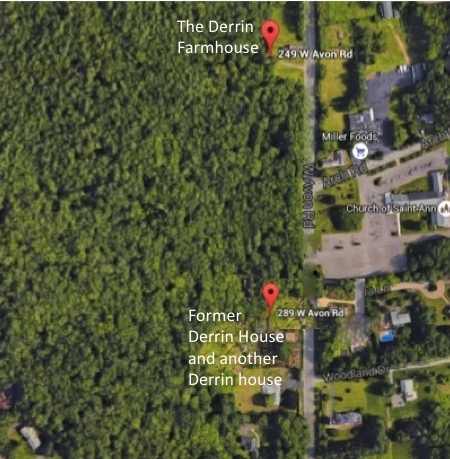 The Derrin family history illustrates well the varied occupations of Connecticut residents and their connections to other places. In a letter to their parents written in 1841, Dan Derrin and Ammi Derrin detail their adventures to Arkansas and the Cherokee Nation. They were selling clocks and surviving by their wits. But they also looked forward to returning home to Avon and building or adding on to houses. “We have been thinking if you see cause to make some addition to the old house or build a new one, we will help you along with it when we get home. The reason why we write is that if you should all be well, you can be making some arrangements for the same as it takes time to build to advantage such as getting timber for joists, studs &c. & for the frame. There is nothing like having everything ready when a job is to be completed. When commencing the plan, you can adopt as you please for your own convenience. Brother Ammi has drawn a plan up. He puts it in [the letter so you] can see what his views is. But I think some other plan would be as convenient & less expensive – or at least not as long as he has drew the plan.” Trading in horse flesh and eating squirrels and wild turkeys had perhaps run its course. The widow of Ammi G. Derrin, Sarah (nee Woodford) (d. 1872) lived in the house up to her death. It is unclear if ownership passed on to one of their sons, but no one occupied it thereafter. In the mid-1950s, the farmhouse and property were owned by the Governor’s Horse Guard and it became the caretaker’s house. The Avon Historical Society, by securing grant money and with the use of volunteer labor, has worked these many years to refurbish the old farmhouse including a new roof, partial electrical, and heating system. The house is furnished sparsely to represent the early farming days in the town’s history. Recently, a 30 foot deep stone well was found under the oldest section of the house. This may yield some interesting information to add to our knowledge base. Also, in 1995 the State Archaeologist at the time, Nicholas Bellantoni, conducted a one day dig around the foundation of the house and recovered 635 artifacts. Some of these are actually items once owned by the Derrins over many generations. It was the opinion of the archaeologist, based on the finding of quartz and flint, that Native Americans may have lived on the property thousands of years ago. The current owners of the home at 289 West Avon Road, John and Chrissie D’Esopo, who began its restoration in 1985, believe that the oldest section of their home dates to c. 1760. This section, which still has its original hearth for cooking and heating, is located in the center of the dwelling. In the historic records from the Marian M. Hunter History Room at the Avon Free Public Library [credit: Betty Morton and Herbert Buttles, Nov. 1978, Land Records III] the owner at that time Mr. Laird (1978) “….understands that the ell of the house was moved from an academy and attached to this house. [This is believed to have been the Avon Academy located on the corner of Country Club and West Avon Roads today]. “According to the old maps [1855, 1869], the house was the home of Daniel Derrin, a farmer and one-time Whig representative to the State legislature. Derrin reported owning 149 acres in the 1880s.” During his time in the legislature Daniel Derrin was interested in educational policy, a priority of the Whig Party in the state. 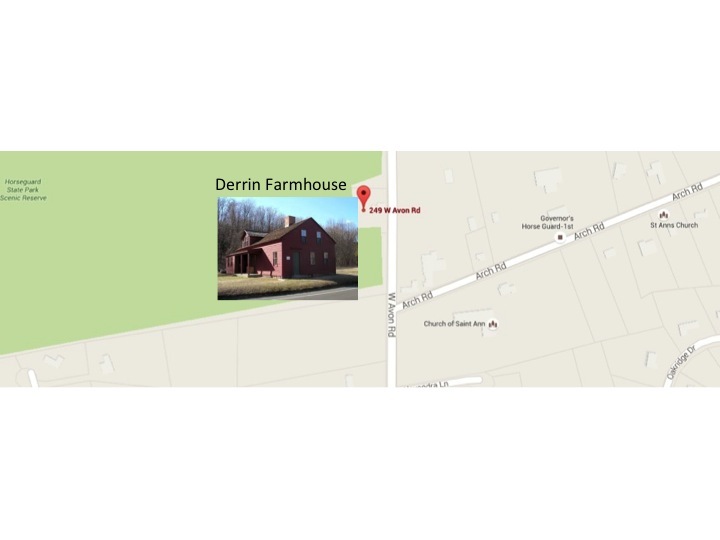 Genealogy: Daniel D. Derrin was the brother of Ammi G. Derrin (249 West Avon Road farmhouse) and was born about 1816. They were the sons of Timothy and Polly Goodrich Derrin. Daniel married Mary L. Jacobs and they had two children: Lizzie C. born 1861, and Winfield Scott, born 1863. Winfield was the last Derrin owner listed in the 1940 U.S. Federal Census. Like his father, Winfield was interested in education, and he served on the Board of Education for the State of Connecticut. The file record at the Marian M. Hunter History Room at the Avon Free Public Library [credit: Betty Morton, The Avon Story, Land Records Group III] contains two old maps, an 1855 map marked Wd. Derrin [Winfield Scott Derrin] and an 1869 map marked J. H. Derrin (Jairus). This house was reputed to have burned down and was located South of today’s 299 West Avon Rd. According to the federal census of 1850, Jairus H. Derrin, the son of Stephen (1759) and Mabel Dorman, was born in 1813. He died on December 5, 1872 at the age of 59. He is buried West Avon Cemetery, Avon, CT in a separate grave from the Derrin obelisk. Bickford, Christopher. Farmington in Connecticut. Phoenix Publishing, 1982. Howard, Nora Oakes. Catch’d on Fire: The Journals of Rufus Hawley, Avon, Connecticut. The History Press, 2011 (from the journals of a prominent minister who lived in the early nineteenth century). MacKie, Mary Frances. Avon, Connecticut: An Historical Story. Phoenix Publishing, 1988.